Chemopalooza: Dear Kareoke - XO! So today started as just a sleepy blah day, but then I ran out to get milk before Mandy, Jeff and Scott came to pick me up and I finally got to meet my across the hall neighbors on my way in!! AND I got to re-meet their pups which are the cutest EVER!!! I of course offered up myself to walk, entertain or whatever with the pups as needed, they probably were thinking "Okay crazy lady I've never met that has been stalking us!" ha ha ha! So then Mandy, Jeff and Scott came over, we had a couple beers (left overs from Chemopalooza part deux - yay more room in my fridge!!) and then went to Steve's birthday party at a bar in Lowell. Surprisingly, it was super fun! Usually on Steve's birthday bash he's pretty sloppy drunk by the time we arrive, but this year he was doing pretty good - and the best part, the was kareoke!!!!!! YAY! We all did the kareoke staple, Love Shack, then we me and Mandy did You're So Vain (not the easiest song!) and then me, Jeff and Scott did Bad Medicine - but by then they were pretty drunk :) And yes, I actually had 2 beers, I figured I had earned it this week- screw the eczema! Weird thing about the beers though, before I had cancer my nose would get super itchy when I would drink beers -- freakishly itchy, and only my nose and only with beer, and not all the time. Anyways, it happened again tonight, whacky I know. Anywho, I just thought I would share my story of my fun kareoke night, old school style! Oh and one more thing, Scott told me the worst pick up line ever - "Once I caught a fish this big (hands a little bit apart), then I caught a fish this big (hands further apart), until I caught a fish THIS big (puts arm around you)." TERRIBLE! Ha haa ha ha! OK Karaoke Queen, you're not going to believe this but 'You're So Vain' is MY Karaoke song - I have to admit to murdering it in many Karaoke bars in my teen years, but I just laughed out loud when I read that you had sung it too!! 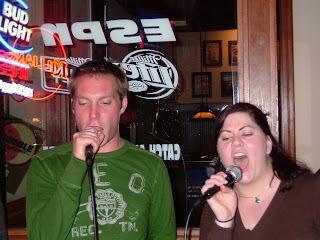 One time my friend an I did "Raspberry Beret" by Prince, which I HIGHLY recommend. I'm sorry hodge crap has been generally sucking (as it it apt to do), and want to let you know that you're in my thoughts. I'd love to know what you'd think of my YA cancer survivor novel. It's called Side Effects.